A lot of amazing stuff was going on in cinema during the 1920s. Feature films became predominant, telling longer and more complex stories to audiences willing to invest time in them. Movie palaces, seating a thousand and more patrons, became a part of the American cityscape. The advent of synchronized sound in 1927 remained the biggest game-changer until movies could be shot in color. In this climate of popularity and growth, some filmmakers were inclined to be more adventurous in their efforts. 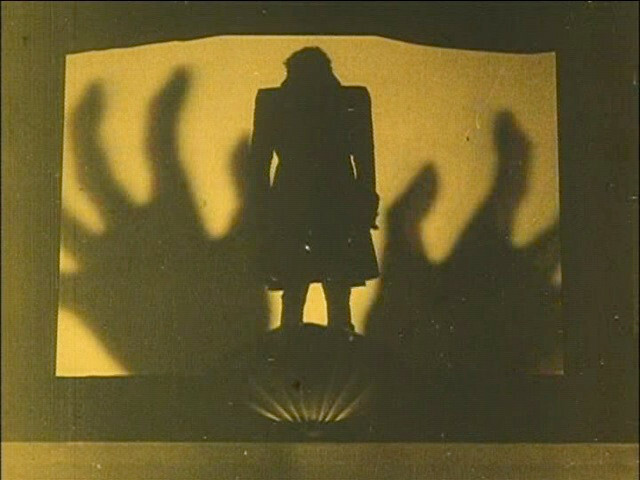 Such a director was Arthur Robinson, who decided to make his film Warning Shadows even more silent than the medium required. 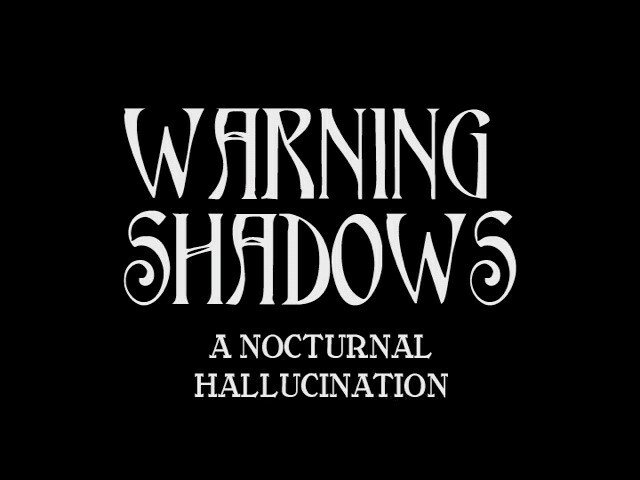 Warning Shadows is a movie that never lets the viewer forget that it’s all just an illusion. The introduction of the cast is done through the means of the Entertainer creating them out of hand puppets. The interstitial titles naming the cast are the only text we’re given; the rest of the movie relies only on pantomime. Even the acts are marked without words, merely counted on fingers in a closeup of a hand. The characters themselves are only identified by their narrative purpose — the chief players being Man (Fritz Kortner), Woman (Ruth Weyher), Youth (Gustav von Wangenheim), and Entertainer (Alexander Granach). The story is also nondescript. Man and Woman are hosting Youth and Gentlemen for an evening of music and dinner. Man is jealous of Woman’s attention to the guests, particularly Youth. It’s all a shadow play — perfectly straightforward and readily understood — and then Entertainer intrudes on the festivities and rips off the facade of civility. After softening everyone up with a puppet show of treachery and infidelity, Entertainer uses the shadows of his audience to show what would happen if they acted on all of their impulses. After experiencing this tragedy as though it was real, the subdued partiers meekly disperse. Man and Woman have very different feelings about their company. What makes this such a remarkable film is the way that the staging and cinematography reinforces the shadow motif and builds a link between the actors and the audience. The Entertainer’s show is the same as the film itself, shadows projected on a screen. Robison reminds us frequently of how light reveals and deceives. Silhouettes on curtains convince Man that Woman is letting the Gentlemen fondle her. Later, within the Entertainer’s illusion, Man sees Woman and Youth in a truly compromising position in the reflection of a mirror. This manipulation of vision is constant, beginning with the presentation of the characters on a theater screen — cast by Entertainer from a hooded light box. 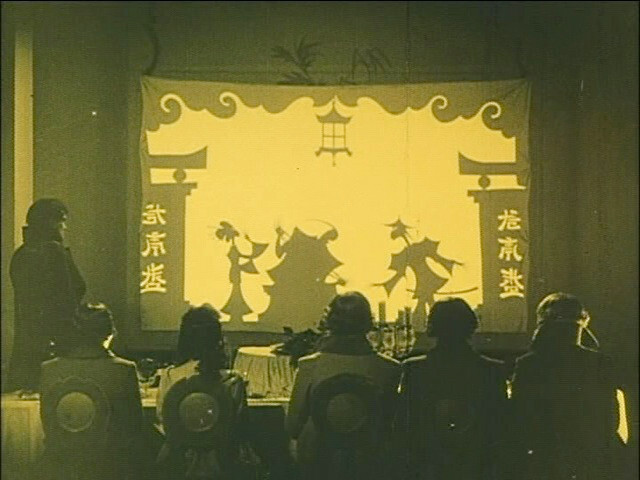 The sequence positions the movie screen as a surrogate for the stage it is displaying, much as the later view of the shadow play joins the audience within the film to the audience without. The party-goers watch Entertainer’s show as we watch them. What is the point of eroding the 4th wall? The lack of personal identity for the characters leaves room for the audience to assume them as masks. The film then encourages the audience to insert themselves into the screen and then into the screen within that one. We’re to learn the lesson of the shadow realm, through the filter of the hallucinating characters. It’s a reminder that we live in Plato’s cave, discerning truth through the shadows that we can see on the walls. If seeing is believing, then Warning Shadows is our reminder that our beliefs are based in illusion.